I’m not seeing many now, possibly because the nights are getting cooler, but I was seeing at least one monarch butterfly each day for quite a while. That might not seem like many but I haven’t seen any over the last couple of years so seeing them every day was a very noticeable and welcome change. For the newcomers to this blog; these “things I’ve seen posts” contain photos of things I’ve seen which, for one reason or another, didn’t fit into other posts. They are usually recent photos but sometimes they might have been taken a few weeks ago, like the butterflies in this post. In any event they, like any other post seen here, are simply a record of what nature has been up to in this part of the world. 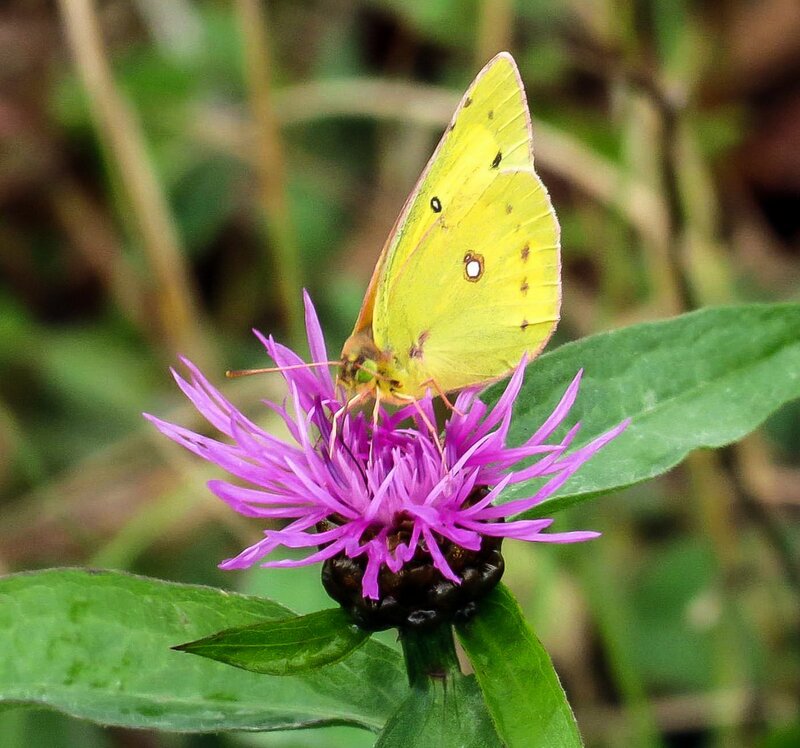 After a rest the knapweeds started blooming again and clouded sulfur butterflies (I think) were all over them. I’ve seen a lot of them this year. They always seem to come later in summer and into fall and I still see them on warm days. This clouded sulfur had a white friend that I haven’t been able to identify. I think this is only the second time I’ve had 2 butterflies pose for the same photo. 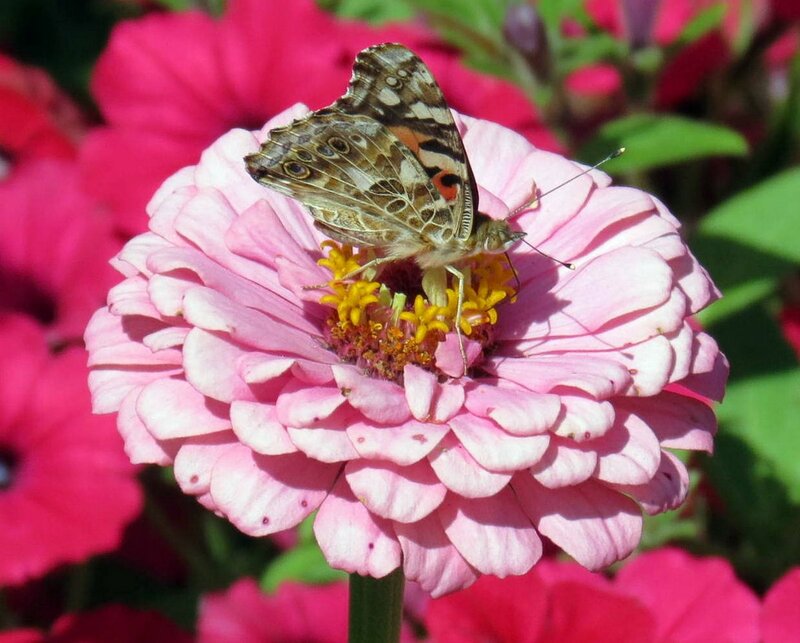 I saw lots of painted ladies on zinnias this year; enough so I think I might plant some next year. I like the beautiful stained glass look of the undersides of its wings. 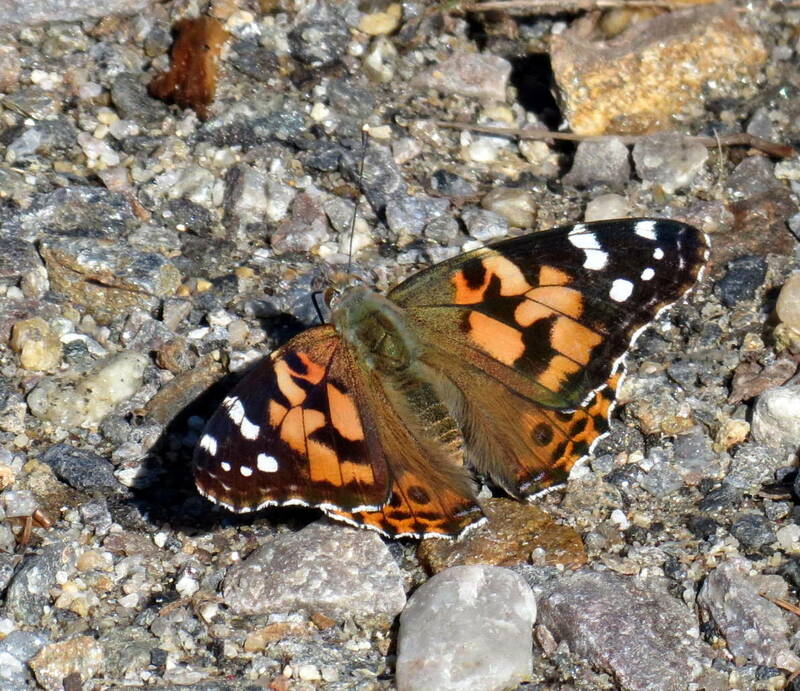 The upper surface of a painted lady’s wings look very different. This one was kind enough to land just in front of me in the gravel of a trail that I was following. 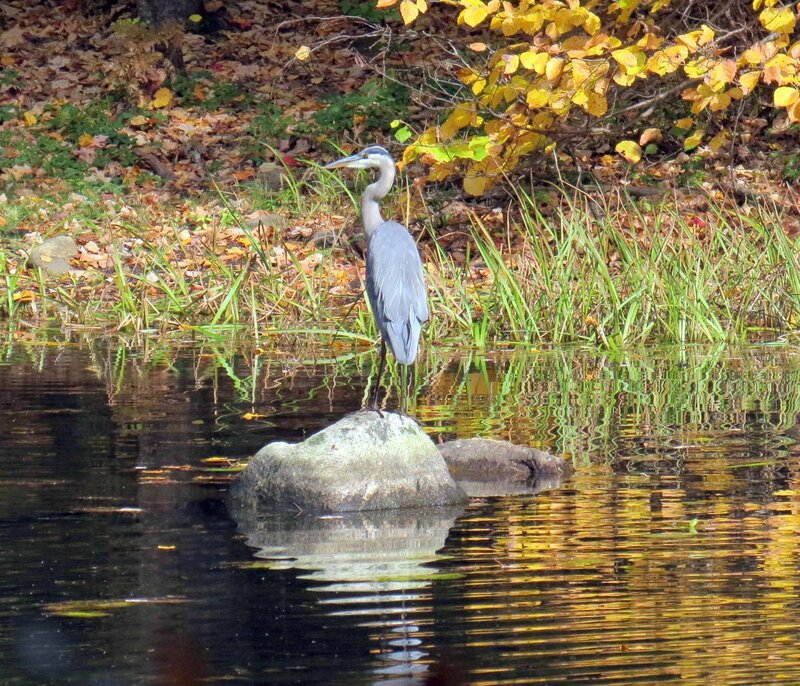 A great blue heron stood motionless on a rock in a pond, presumably stunned by the beauty that surrounded it. It was one of those that likes to pretend it’s a statue, so I didn’t wait around for what would probably be the very slow unfolding of the next part of the story. 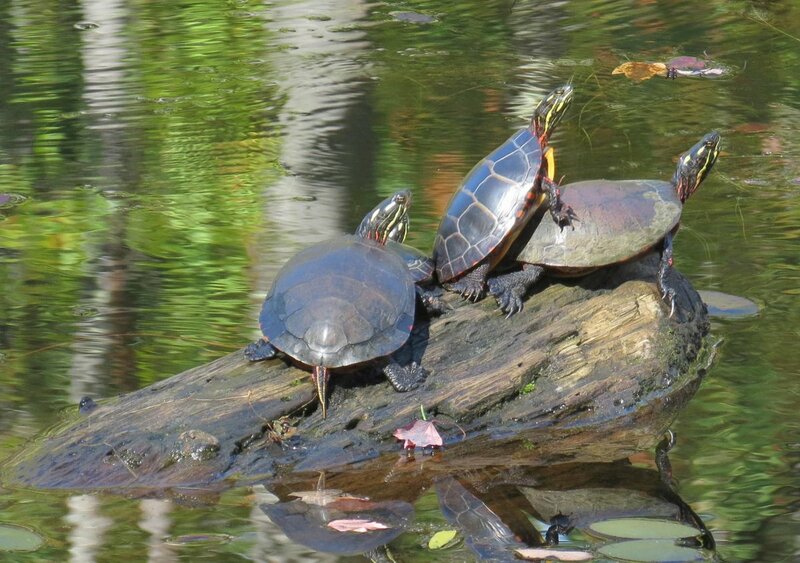 Three painted turtles all wanted the same spot at the top of a log in the river. They seem to like this log, because every time I walk by it there are turtles on it. 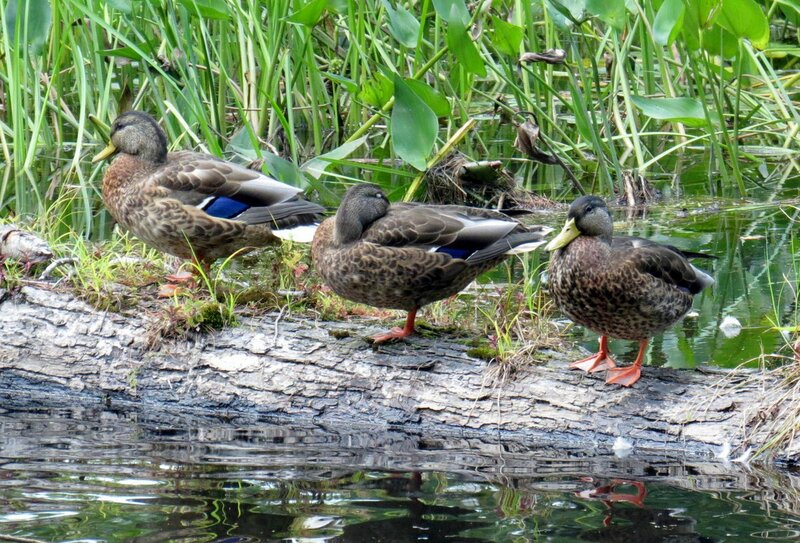 Three ducks dozed and didn’t seem to care who was where on their log in the river. Ducks and turtles weren’t the only things on logs. Scaly pholiota mushrooms (Pholiota squarrosa) covered a large part of this one. 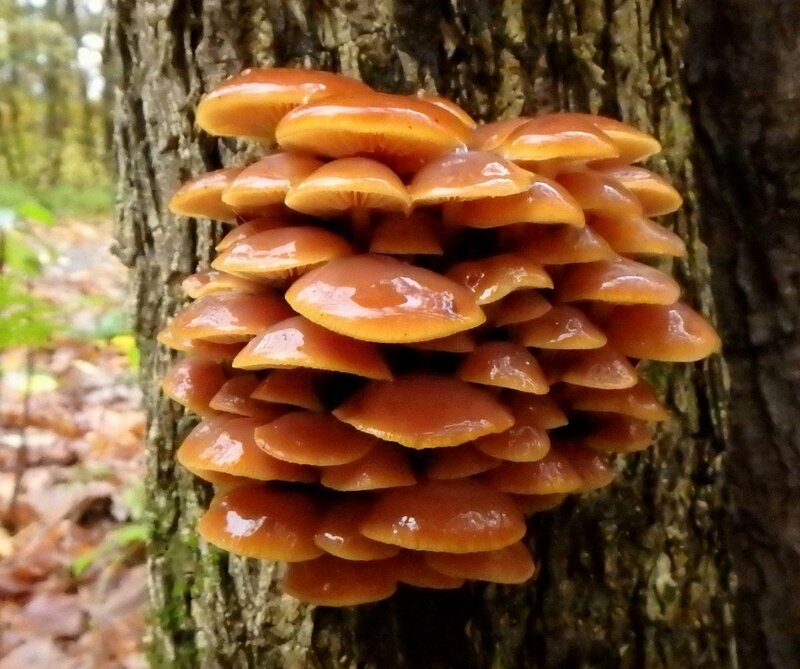 This mushroom is common and looks like the edible honey mushroom at times, but it is not edible and is considered poisonous. They are said to smell like lemon, garlic, radish, onion or skunk, but I keep forgetting to smell them. They are said to taste like radishes by those unfortunate few who have tasted them. 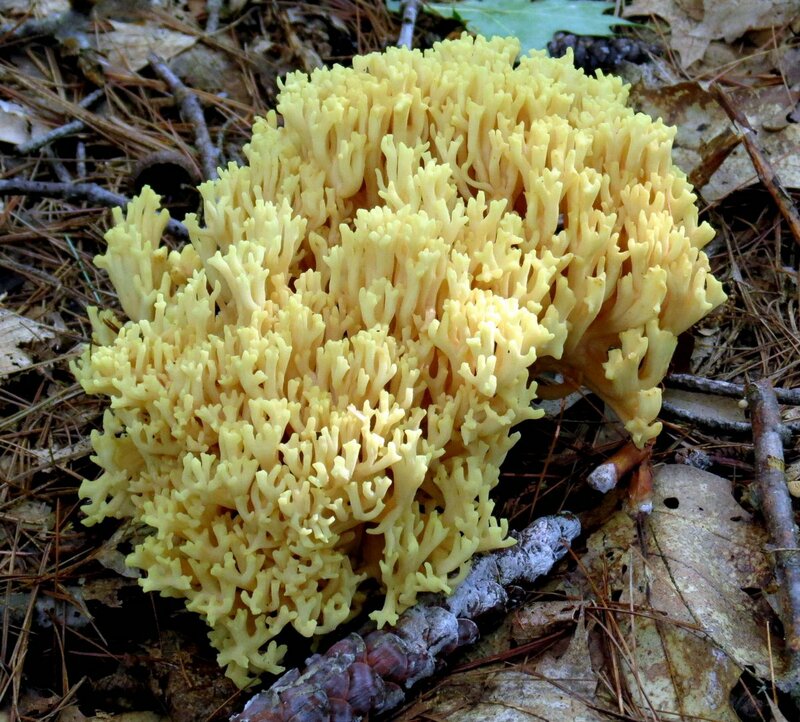 There are so many coral mushrooms that look alike they can be hard to identify, but I think this one might have been yellow tipped coral (Ramaria formosa.) Though you can’t see them in this photo its stems are quite thick and stout and always remind me of broccoli. Some of these corals get quite big and they often form colonies. This one was about as big as a cantaloupe and grew in a colony of about 8-10 examples, growing in a large circle. Comb tooth fungus (Hericium ramosum) grows on well-rotted logs of deciduous trees like maple, beech, birch and oak. It is on the large side; this example was about as big as a baseball, and its pretty toothed branches spill downward like a fungal waterfall. 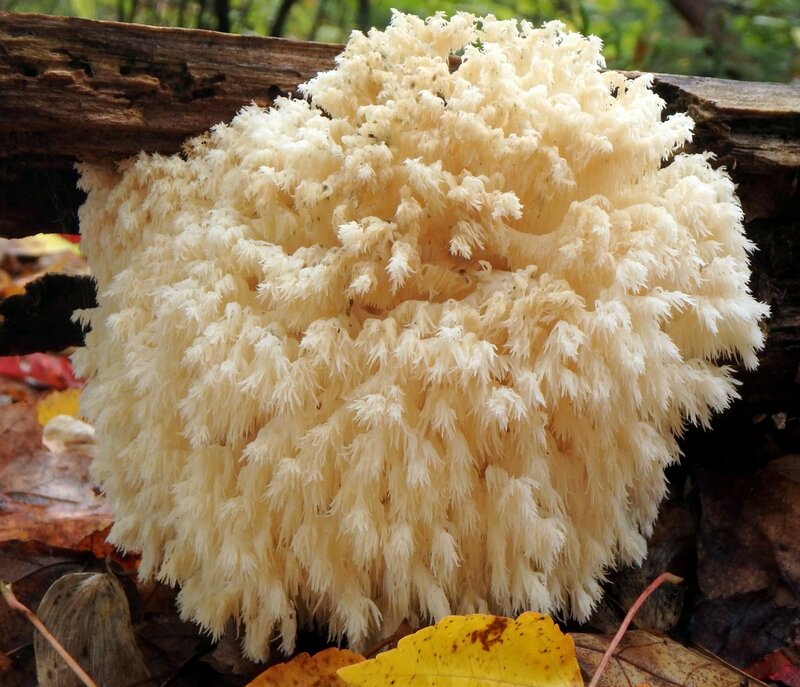 It is said to be the most common and widespread species of Hericium in North America, but I think this example is probably only the third one I’ve seen in over 50 years of looking at mushrooms. Something I see quite a lot of in late summer is the bolete called Russell’s bolete (Boletellus russellii.) Though the top of the cap isn’t seen in this shot it was scaly and cracked, and that helps tell it from look alikes like the shaggy stalked bolete (Boletellus betula) and Frost’s bolete (Boletus frostii.) All three have webbed stalks like that seen above, but their caps are very different. Sometimes you can be seeing a fungus and not even realize it. Or in this case, the results of a fungus. 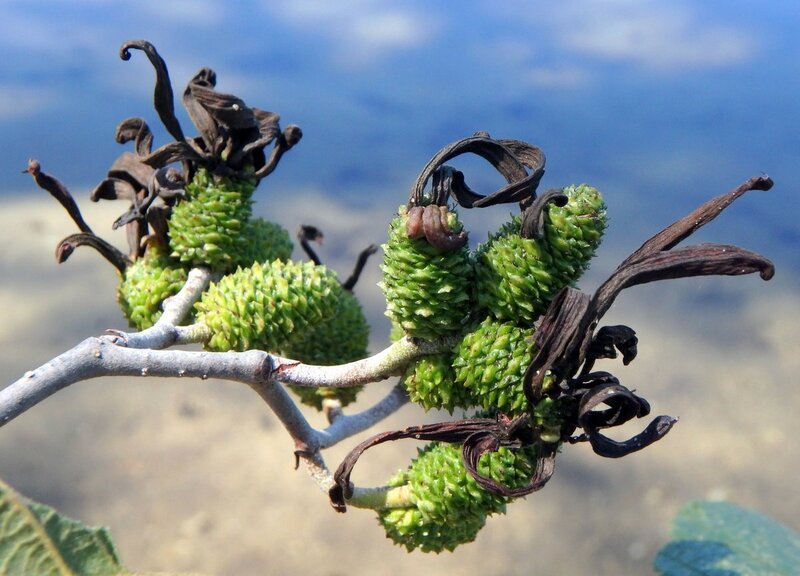 The fungus called Taphrina alni attacks female cone-like alder (Alnus incana) catkins (Strobiles) and chemically deforms part of the ovarian tissues, causing long tongue like galls known as languets to form. These galls will persist until the strobiles fall from the plant; even heavy rain and strong winds won’t remove them. Though I haven’t been able to find information on its reproduction I’m guessing that the fungal spores are produces on these long growths so the wind can easily take them to other plants. Elderberries (Sambucus canadensis) are having a great year. I don’t think I’ve ever seen as many berries (drupes) as we have this year. The berries are edible but other parts of the plant contain calcium oxalate and are toxic. Native Americans dried them for winter use and soaked the berry stems in water to make a black dye that they used on their baskets. 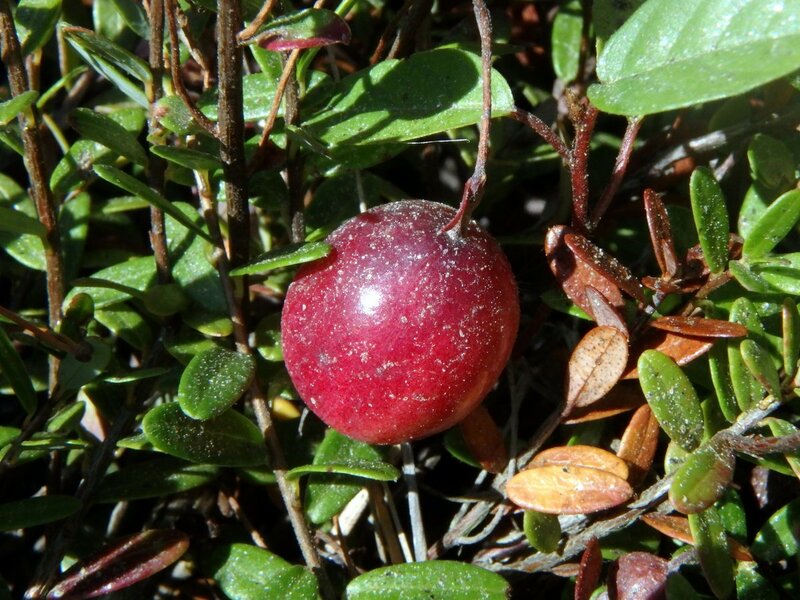 Native cranberries (Vaccinium macrocarpon) are also having a good year. 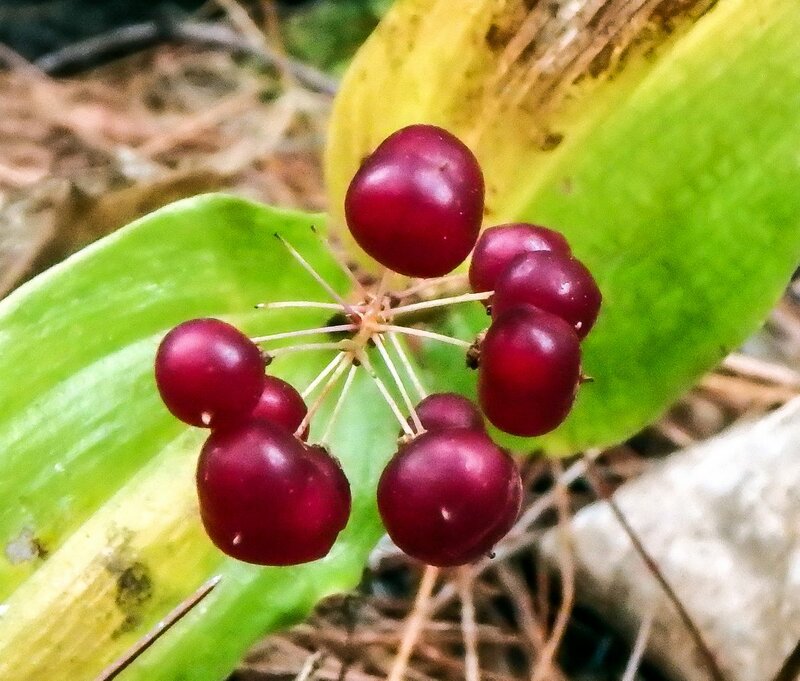 The Pilgrims named this fruit “crane berry” because they thought the flowers looked like Sandhill cranes. 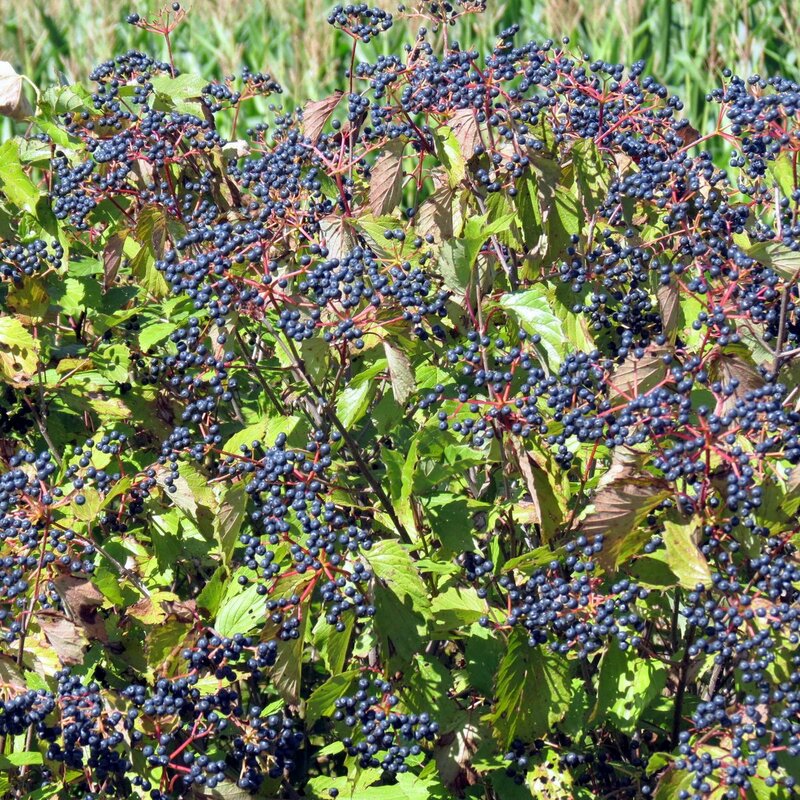 Native Americans used the berries as both food and medicine, and even made a dye from them. They taught the early settlers how to use the berries and I’m guessing that they probably saved more than a few lives doing so. Cranberries are said to be one of only three fruits native to North America; the other two being blueberries and Concord grapes, but I say what about the elderberries we just saw and what about crab apples? There are also many others, so I think whoever said that must not have thought it through. In my own experience I find it best to leave plants with white berries alone because they are usually poisonous, and no native plant illustrates this better than poison ivy (Toxicodendron radicans.) Though many birds can eat its berries without suffering, when most humans so much as brush against the plant they can itch for weeks afterward, and those who are particularly sensitive could end up in the hospital. I had a friend who had to be hospitalized when his eyes became swollen shut because of it. Eating any part of the plant or even breathing the smoke when it is burned can be very dangerous. 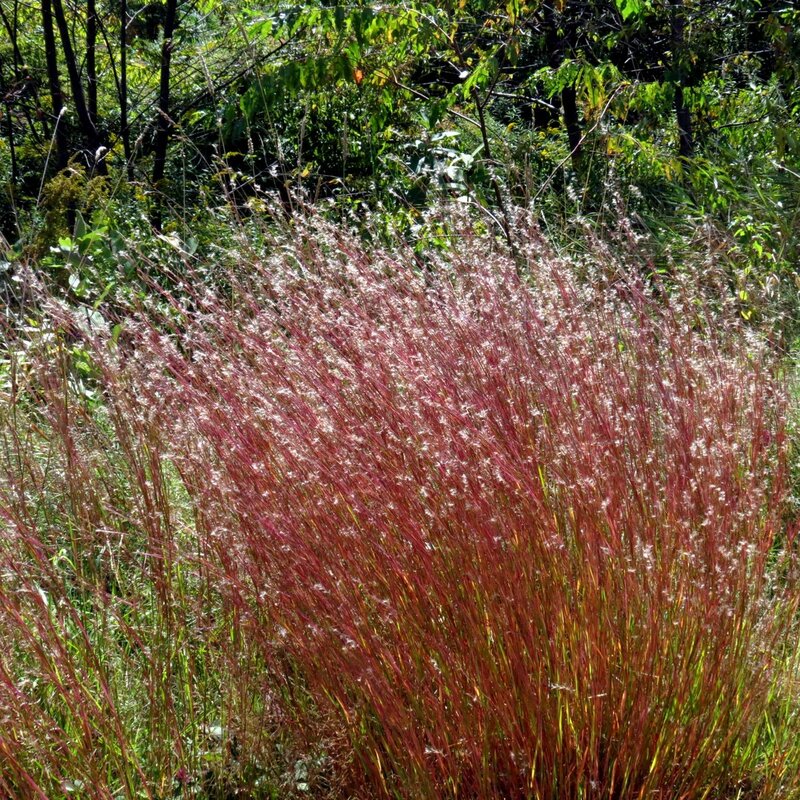 Native bluestem grass (Schizachyrium scoparium) catches the light and glows in luminous ribbons along the roadsides. This is a common grass that grows in every U.S. state except Nevada and Washington, but is so uncommonly beautiful that it is grown in gardens. 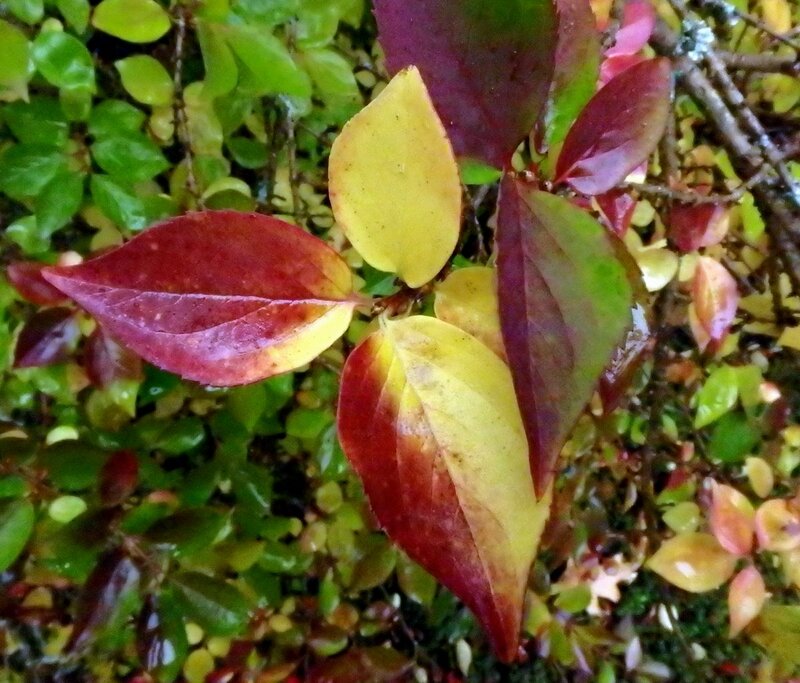 After a frost it takes on a reddish purple hue, making it even more beautiful. 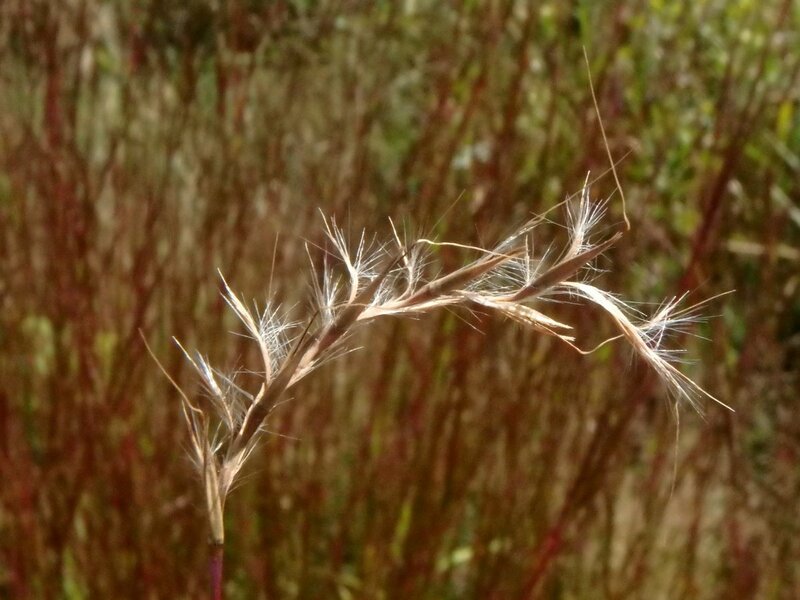 It is the way its seed heads reflect the light that makes little bluestem grass glow like it does. 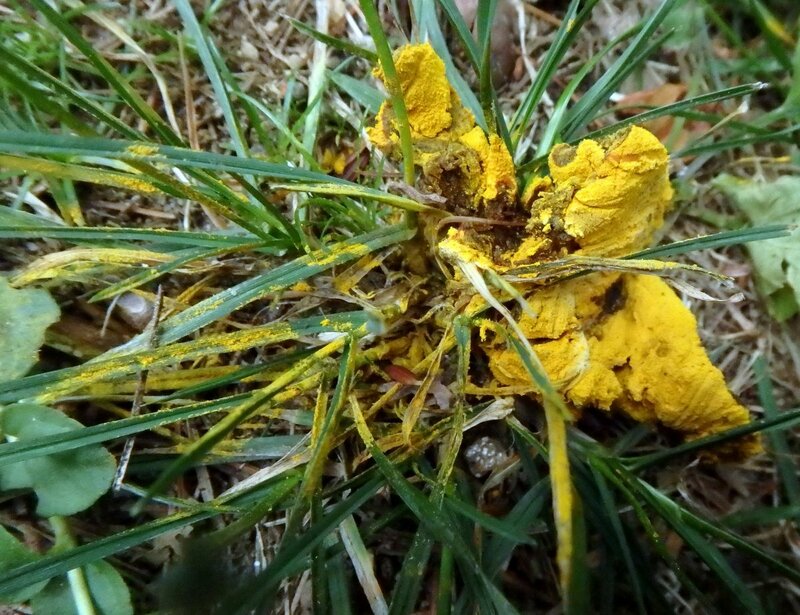 I think the above photo is of the yellow fuzz cone slime mold (Hemitrichia clavata.) 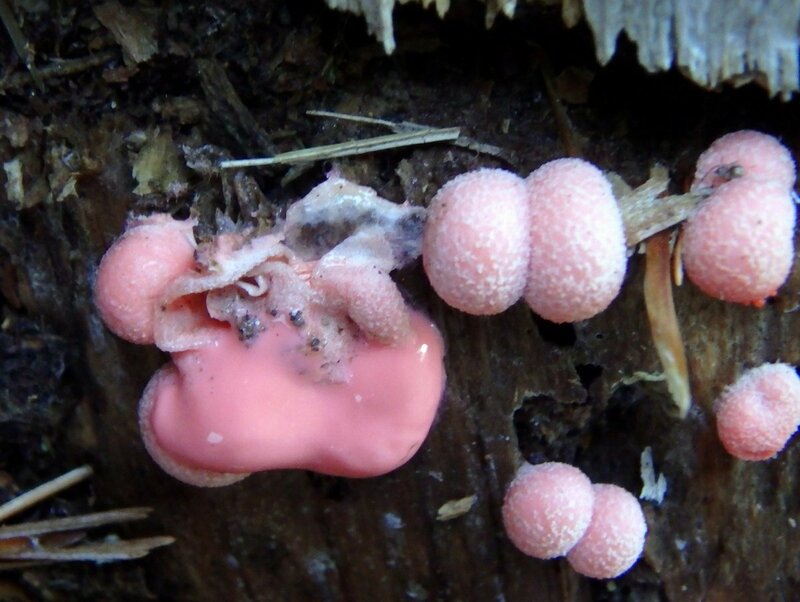 The most unusual thing about this slime mold is how it appears when the weather turns colder in the fall. Most other slime molds I see grow during warm, wet, humid summers but I’ve seen this one even in winter. Though it looks like it was growing on grass I think there must have been an unseen root or stump just under the soil surface, because this one likes rotten wood. It starts life as tiny yellow to orange spheres (sporangia) that finally open into little cups full of yellowish hair like threads on which the spores are produced. 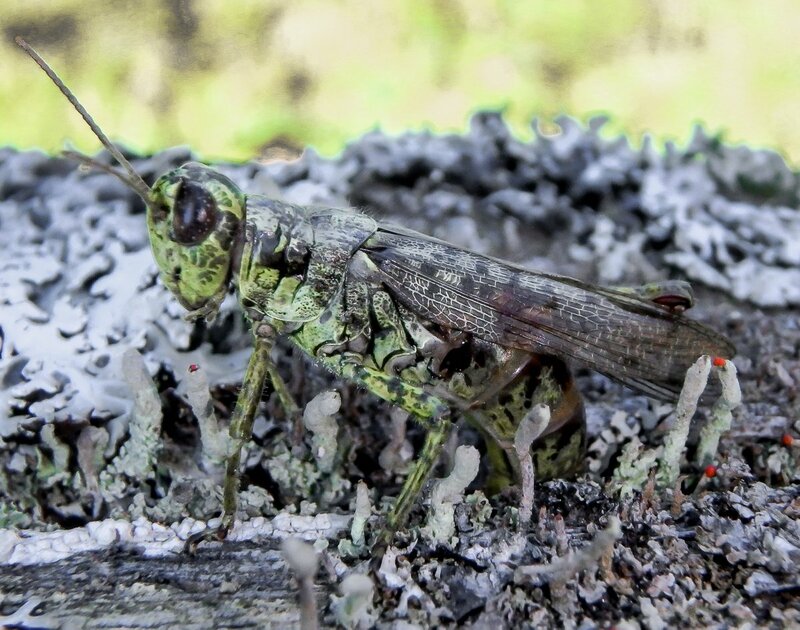 I was looking at lichens one day when I came upon this grasshopper. The lichens were on a fence rail and so was the grasshopper, laying eggs in a crack in the rail. This is the second time I’ve seen a grasshopper laying eggs in a crack in wood so I had to look it up and see what it was all about. It turns out that only long horned grasshoppers lay eggs in wood. Short horned grasshoppers dig a hole and lay them in soil. They lay between 15 and 150 eggs, each one no bigger than a grain of rice. The nymphs will hatch in spring and live for less than a year. 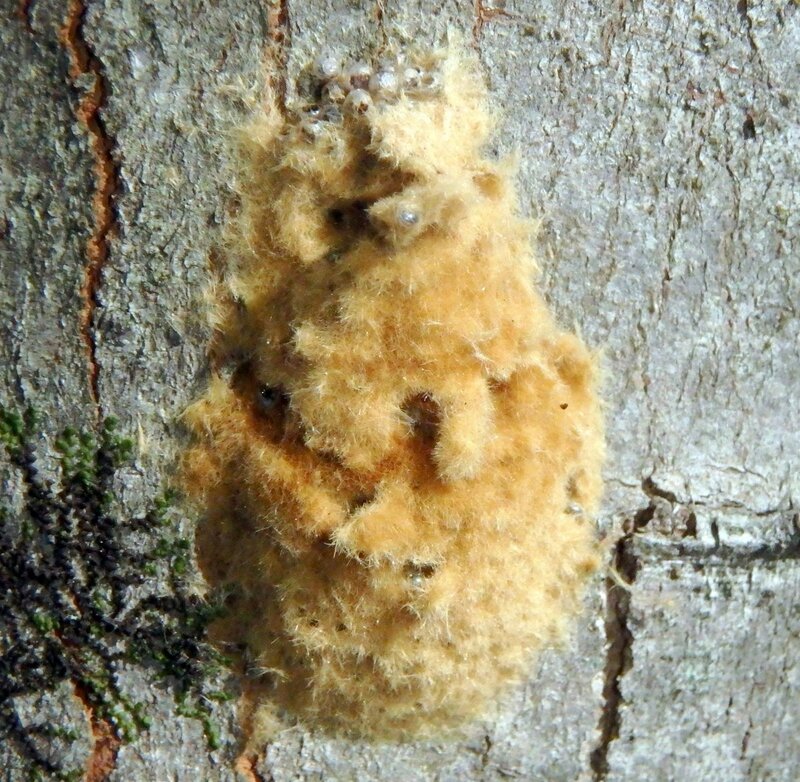 The gypsy moth egg cases I’ve seen have been smooth and hard, but this example was soft and fuzzy so I had to look online at gypsy moth egg case examples. From what I’ve seen online this looks like one. European gypsy moths were first brought to the U.S. in 1869 from Europe to start a silkworm business but they escaped and have been in the wild ever since. 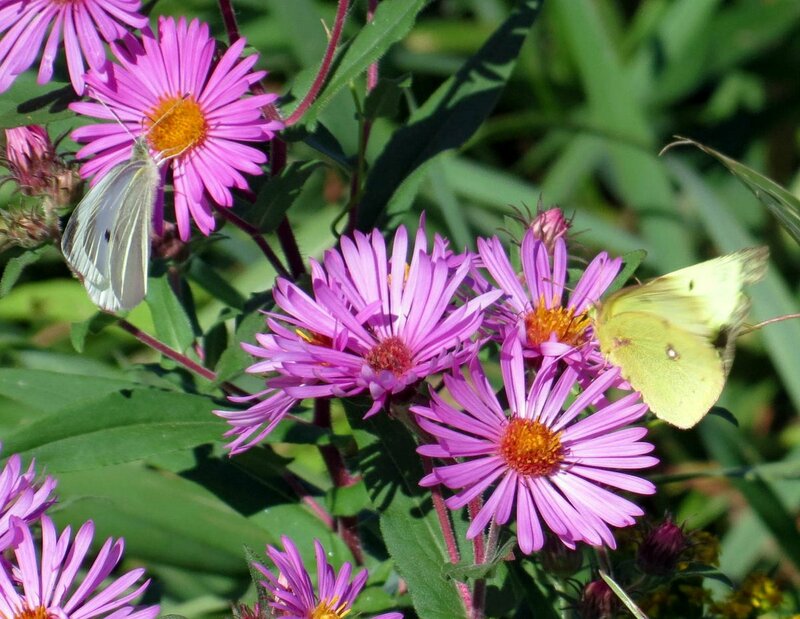 In the 1970s and 80s gypsy moth outbreaks caused many millions of dollars of damage across the northeast by defoliating and killing huge swaths of forest. I remember seeing, in just about every yard, black stripes of tar painted around tree trunks or silvery strips of aluminum foil wrapped around trunks. The theory was that when the caterpillars crawled up the trunk of a tree to feed they would either get stuck in the tar or slip on the aluminum foil and fall back to the ground. Today, decades later, you can still see the black stripes of tar around some trees. Another gypsy moth population explosion happened in Massachusetts last year and that’s why foresters say that gypsy moth egg cases should be destroyed whenever they’re found. I didn’t destroy this one because at the time I wasn’t positive that it was a gypsy moth egg case. If you look closely at the top of it you can see the tiny spherical, silvery eggs. I think a bird had been at it. 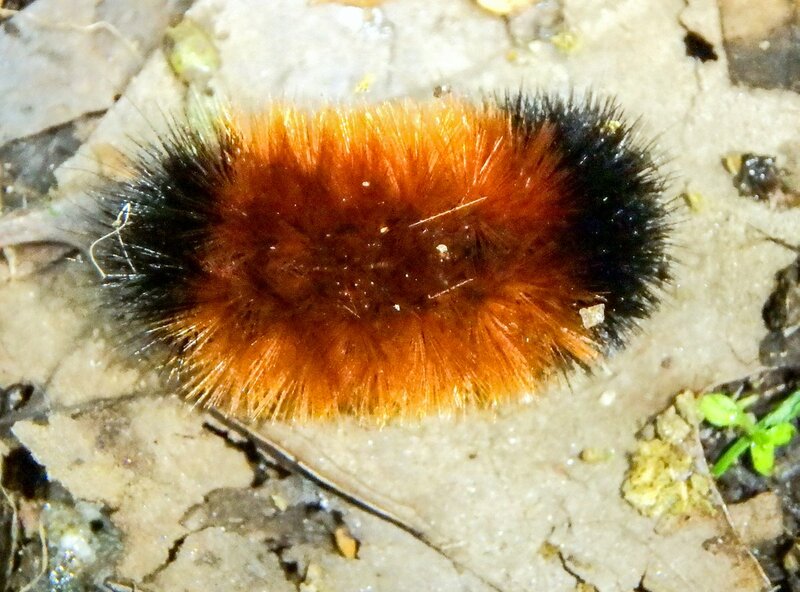 Folklore says that the wider the orangey brown band on a wooly bear caterpillar is, the milder the winter will be. If we’re to believe it then this winter will be very mild indeed, because this wooly bear has more brown on it than I’ve ever seen. In any event this caterpillar won’t care, because it produces its own antifreeze and can freeze solid in winter. Once the temperatures rise into the 40s F in spring it thaws out and begins feeding on dandelion and other early spring greens. Eventually it will spin a cocoon and emerge as a beautiful tiger moth. From that point on it has only two weeks to live. 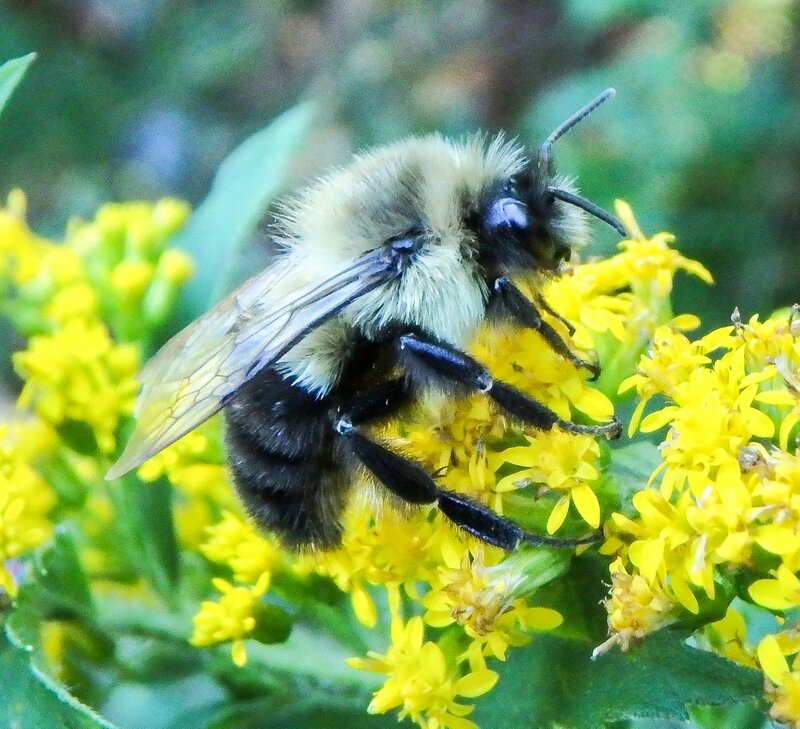 This bumblebee hugged a goldenrod flower head tightly one chilly afternoon. I thought it had died there but as I watched it moved its front leg very slowly. Bumblebees sleep and even die on flowers and they are often seen at this time of year doing just what this one was doing. I suppose if they have to die in winter like they do, a flower is the perfect place to do so. Only queen bumblebees hibernate through winter; the rest of the colony dies. In spring the queen will make a new nest and actually sit on the eggs she lays to keep them warm, just like birds do. 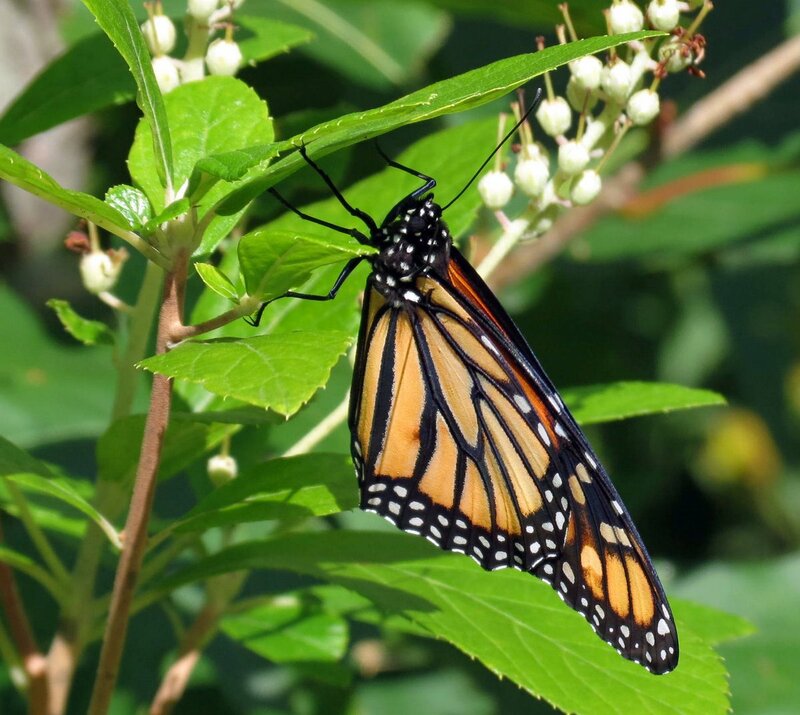 I’ll end this post the way I started it, with a monarch butterfly. I do hope they’re making a comeback but there is still plenty we can do to help make that happen. Planting zinnias might be a good place to start. 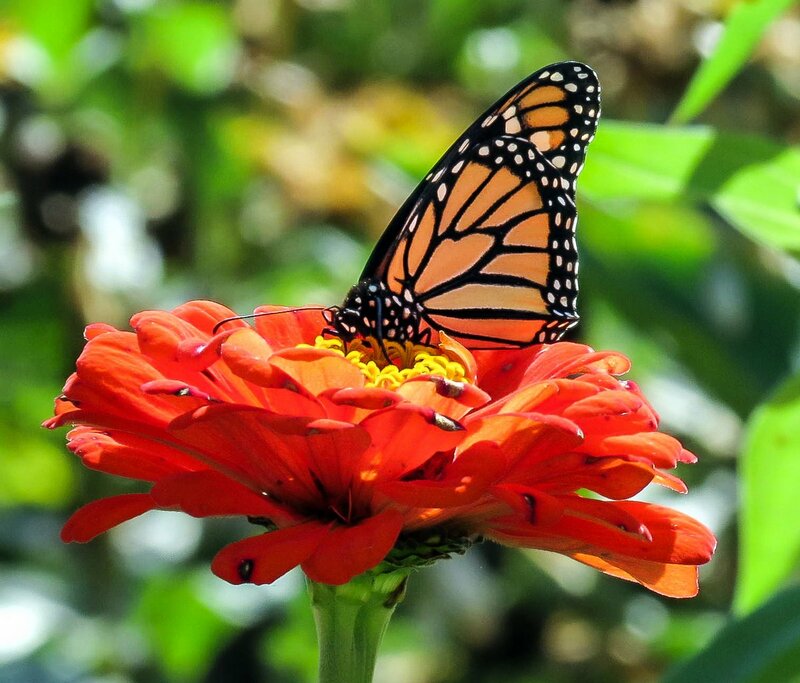 At least, even if the monarchs didn’t come, we’d still have some beautiful flowers to admire all summer. Do mushrooms wait until it rains before they fruit? This purple cort (Cortinarius iodeoides) would have me answer yes to that question because it’s the latest I’ve ever seen them. I usually find them in August. Mushrooms are the fruiting body of mycelium, which is found underground. 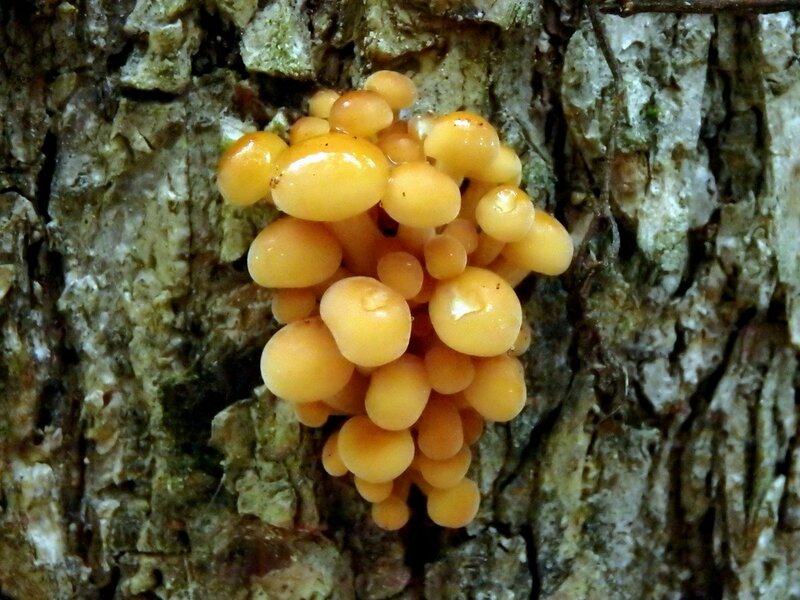 The mycelium could be compared to a tree and the mushroom its fruit. The fruit is what we see growing above ground, but this fruit has spores instead of seeds. Rain helps mushrooms spread their spores., so it would make sense for them to wait for rain to fruit. We had a good day of rain recently and finally, here are the mushrooms. 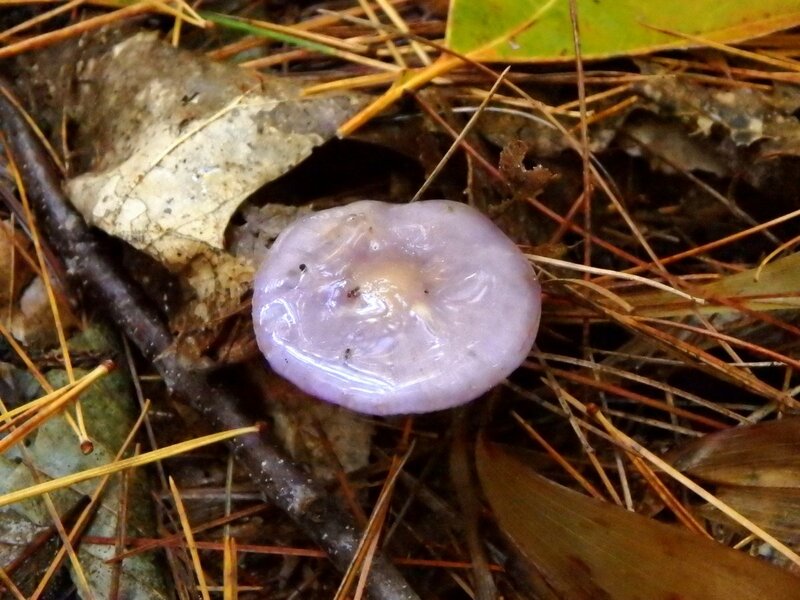 Purple corts often have a slimy cap and are toxic enough to make you sick. Slugs are the only critters that I’ve seen eat them. 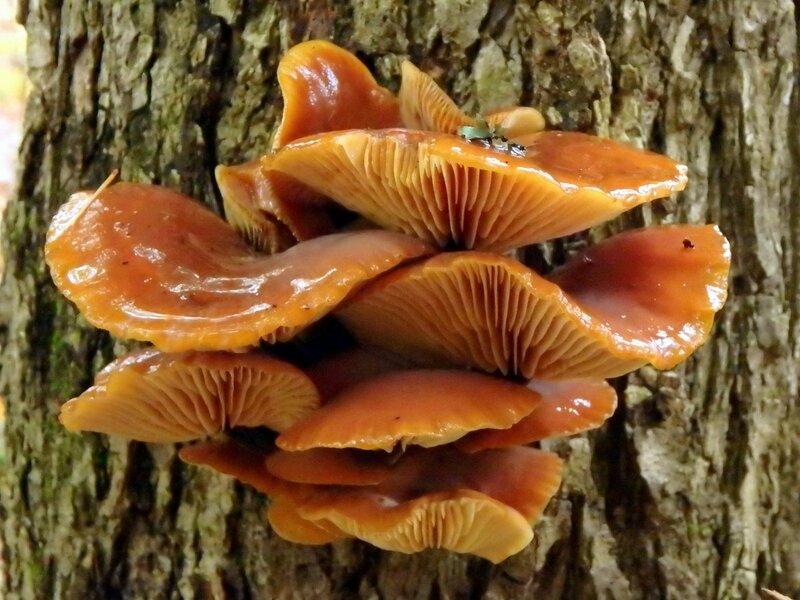 Velvet foot (Flammulina velutipes) mushrooms are considered a “winter mushroom” and they can usually be found from October through early spring. Though many say that they grow on logs I always find them growing in clusters on standing trees, particularly on American elm (Ulmus americana) as they were in this photo. They are very cold hardy and I sometimes find them dusted with snow. This group had just appeared and was very small; no more than an inch and a half high. On another nearby elm tree this grouping, probably about six inches from top to bottom, grew. 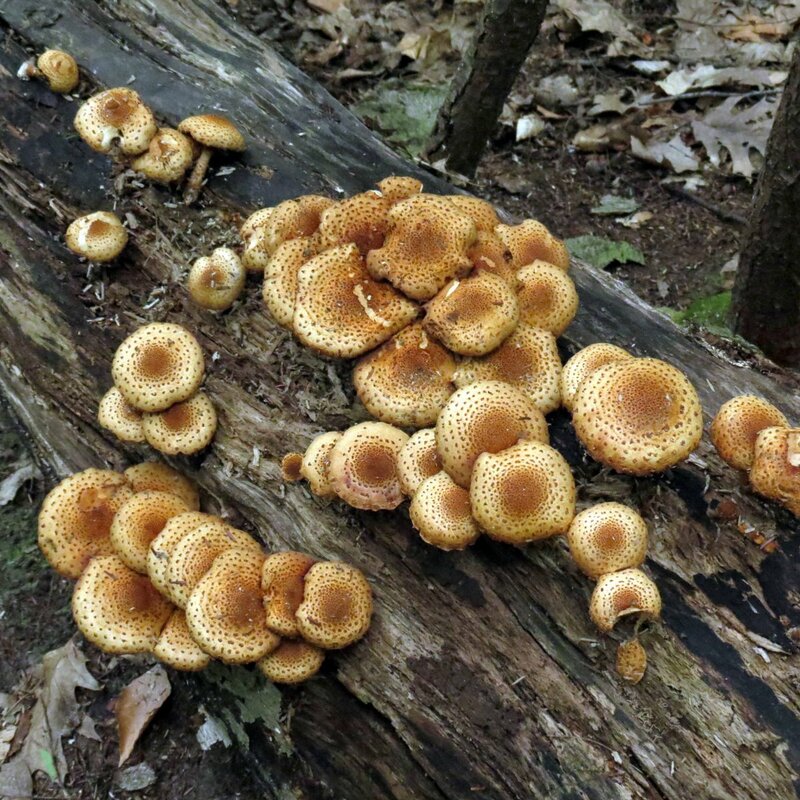 The orange caps of these mushrooms often shade to brown in the center and are very slimy and sticky. The stem is covered in fine downy hairs that darken toward the bottom and that’s where their common name comes from. When the temperature drops below freezing on a winter day it’s a real pleasure to see them. Turkey tails (Trametes versicolor) have been all but invisible this year but I did find the brown ones pictured here recently. I was hoping for another year like last year when they grew in beautiful shades of blue, purple, and orange but I suppose the drought has affected them. 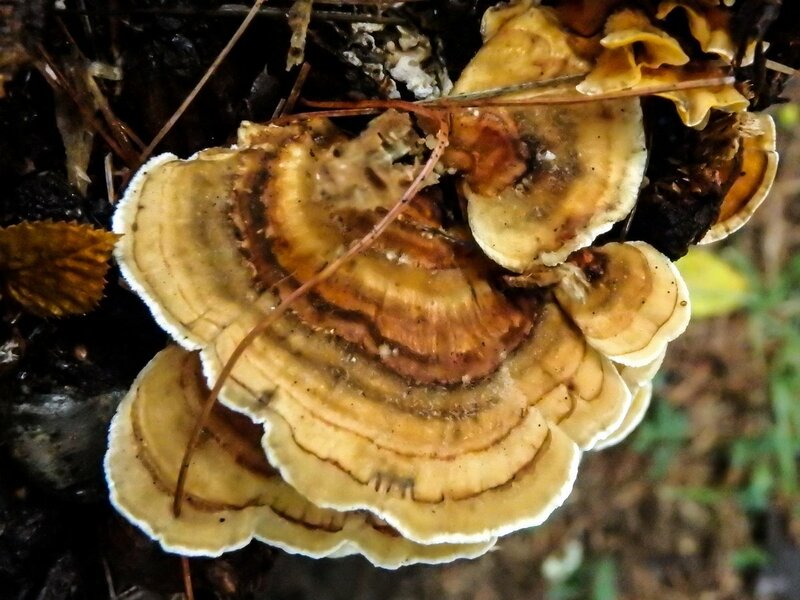 This bracket fungus gets its common name from the way it resembles a turkey’s tail, and according to the American Cancer Society there is some scientific evidence that substances derived from turkey tail fungi may be useful against cancer. 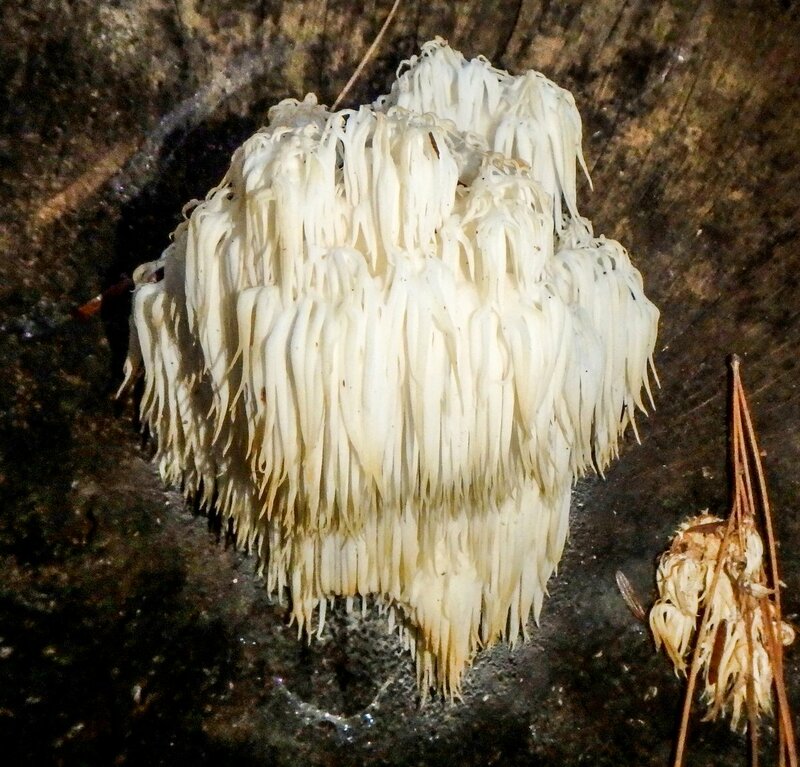 Bear’s head, also called lion’s mane mushroom (Hericlum americanum) is a beautiful toothed fungus that looks like a fungal waterfall. Soft spines hang from branches that reach out from a thick central stalk. As it ages it will change from white to cream to brown, and the brown tips on this example means it has aged some. This one was small; about the same size as a hen’s egg, but I’ve seen them as big as a grapefruit. They seem to fruit toward the end of summer but this year they’re later than in recent years. I keep my eye out at this time of year for what look like small, pea size white or pink puffballs. They aren’t puffballs though, so if you squeeze them you’ll be in for a surprise. 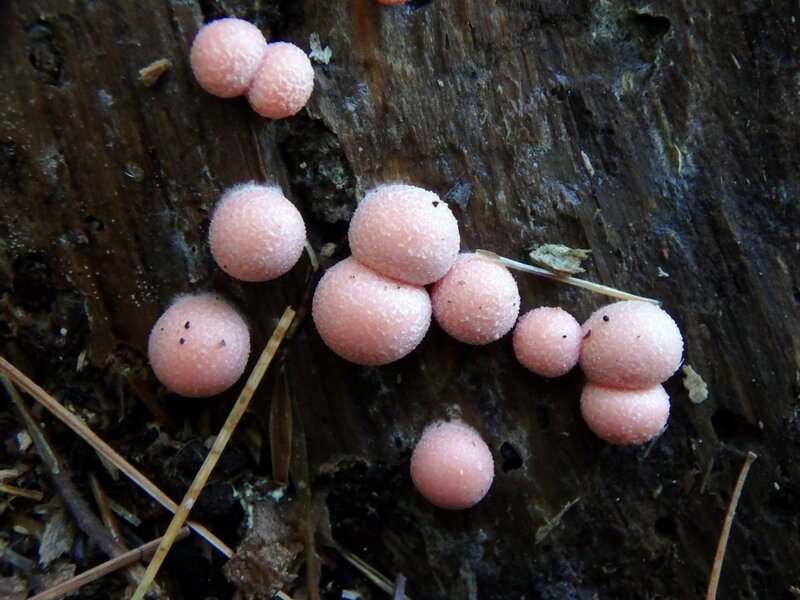 The “puffballs” are actually a slime mold called wolf’s milk slime mold (Lycogala epidendrum) and if you squeeze them when they’re young instead of the smoke like spores you would expect from a puffball, you often get pink or orange liquid. Though books say that the consistency is that of toothpaste I almost always find liquid like that seen in the photo. As it ages the liquid will become like toothpaste before finally turning into a mass of brown powdery spores. By that time the outside will have also turned brown and at that stage of its life this slime mold could probably be confused with a small puffball. I think these examples were very young. Something you don’t hear much about until you have a drought is how the dryness weakens the trees enough to make them topple over. Dryness can cause the root system to shrink and makes it hard for the roots to hold onto the dry soil. Without a good strong root system trees can become almost top heavy. 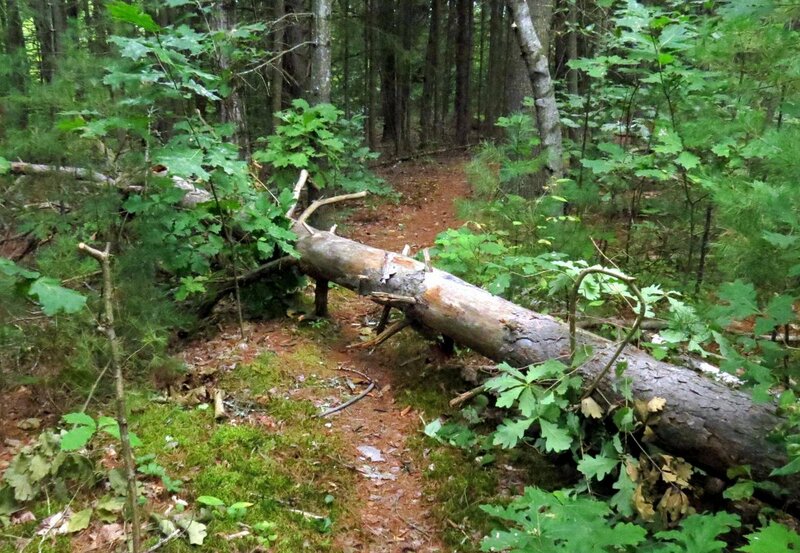 Sometimes all it takes is a gust of wind to bring down a big tree like the one in the above photo, so you have to watch the weather before going into the woods. I just heard that, rather than a single summer of drought, this current one has been ongoing for about 4 years. Though that may be true this was the first year that it was so obviously dry in this corner of the state. Falling trees or not I’ll be going into the woods because that’s where you find things like this beautiful maple leaf viburnum (Viburnum acerifolium.) 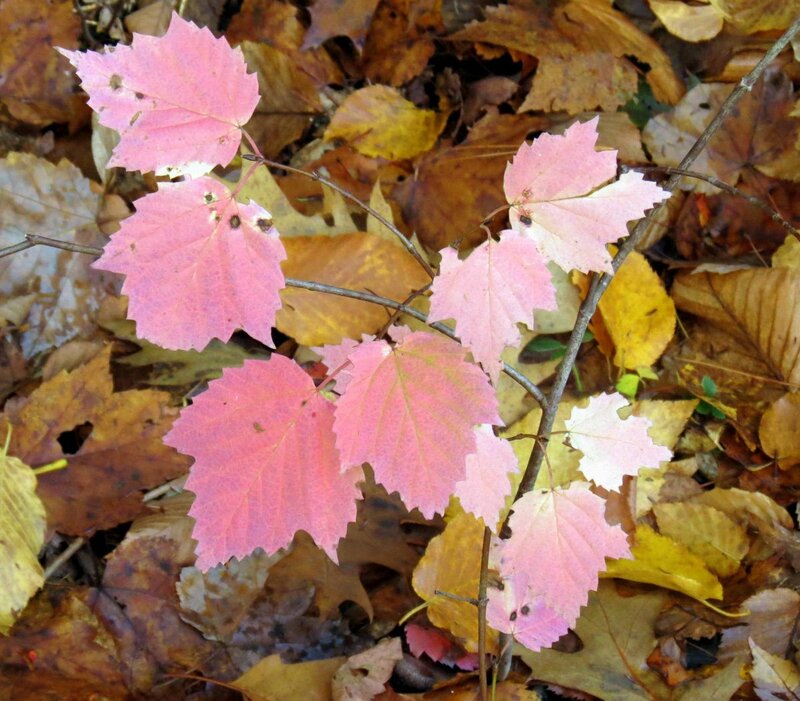 The leaves on this native shrub have an amazing color range, from purple to orange to pink, but they always end up almost white, with just a faint hint of pastel pink. There are many berries ripening right now and the birds are happy. 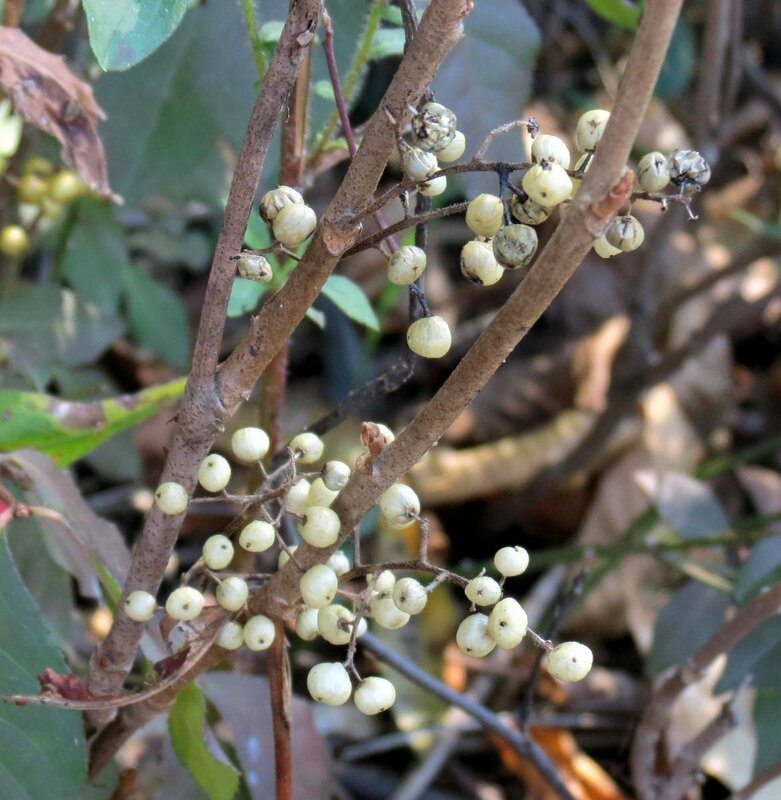 Unfortunately they love the berries of invasive Oriental bittersweet and help it in its quest to rule the world. This vine is very strong like wire and as it twines its way around tree trunks it strangles them. Once it reaches the tree canopy it grows thickly and covers it, stealing all the light from the tree. It’s common to see a completely dead tree still supporting a tangle of bittersweet, and sometimes the vine is the only thing holding it up. 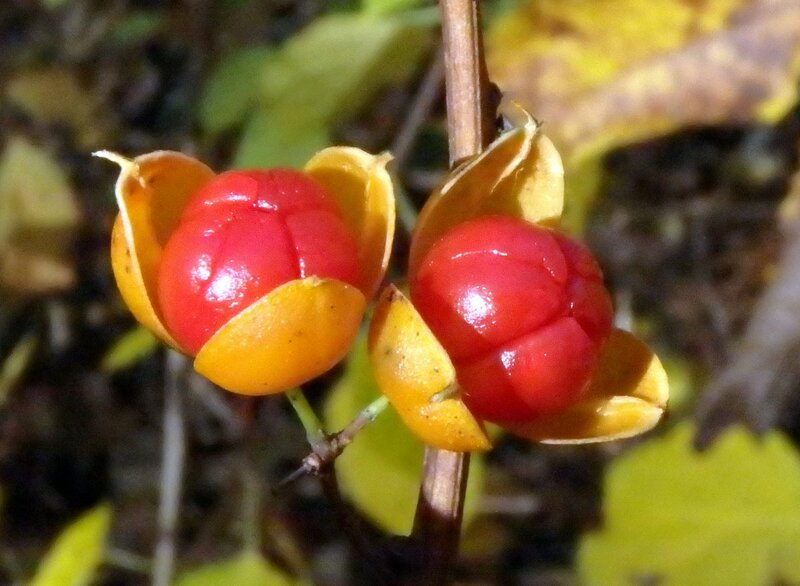 Another invasive that’s fruiting right now is burning bush (Euonymus alatus.) 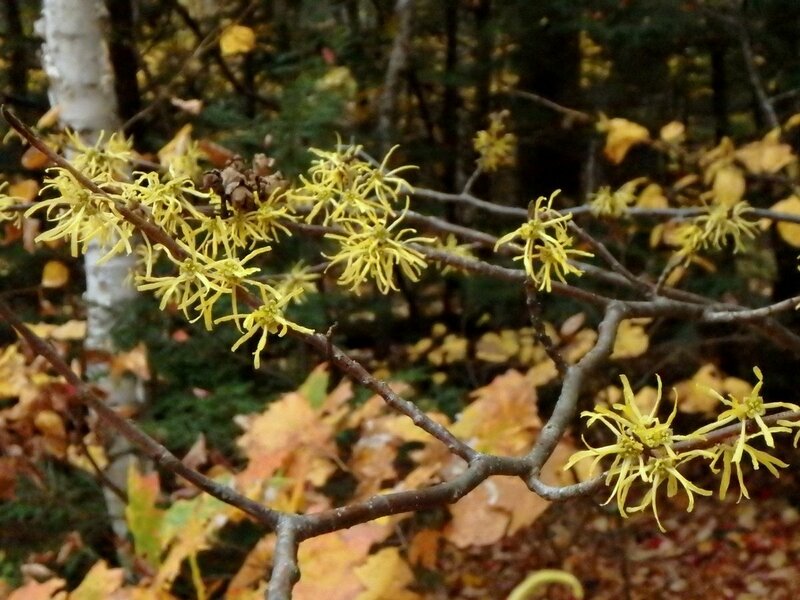 It’s a beautiful shrub in the fall but Its sale and importation is banned here in New Hampshire now because of the way it can take over whole swaths of forest floor. Birds love the berries and spread the seeds everywhere, so it isn’t uncommon to find a stand of them growing in the woods. I know a place where hundreds of them grow and though they are beautiful at this time of year not another shrub grows near them. This is because they produce such dense shade it’s hard for anything else to get started. Canada mayflower (Maianthemum canadense) is described as “a dominant understory perennial flowering plant” and dominate it is, often covering huge swaths of shaded forest floor. It forms monocultures in forests and also invades woodland gardens, where it is almost impossible to eradicate. Its tiny white four petaled flowers become red berries that are loved by many birds and small animals. It’s a native plant that acts like an invasive. 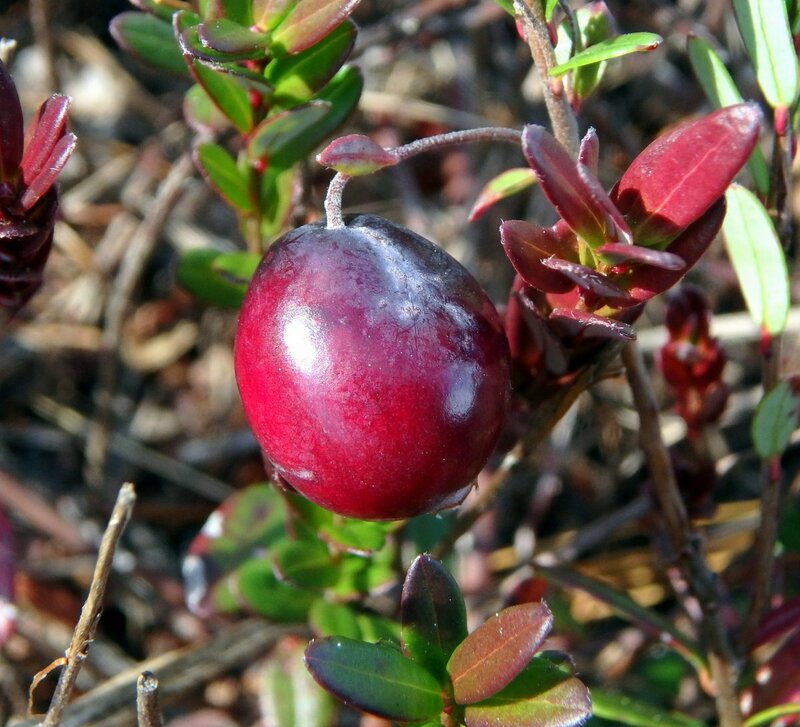 The native cranberries (Vaccinium macrocarpon) have ripened and normally you’d get your feet wet harvesting them, but this year they were high and dry because of the drought. 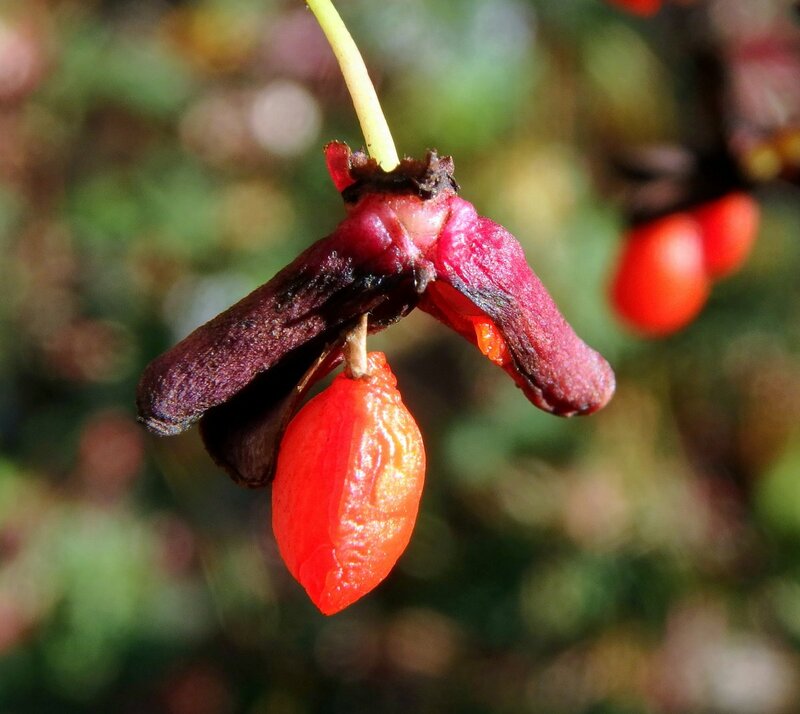 The pilgrims named this fruit “crane berry” because they thought the flowers looked like sandhill cranes. They were taught how to use the berries by Native Americans, who used them as a food, as a medicine, and as a dye. Bears, deer, mice, grouse and many other birds eat the fruit. 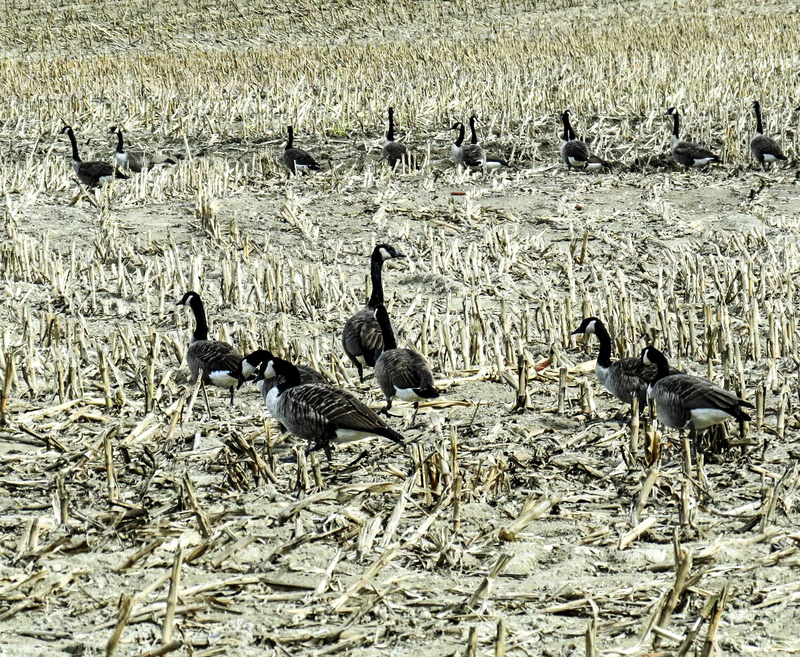 Each year for as long as I can remember hundreds of Canada geese have stopped over on their way south in the fall to glean what they can from the cornfields. The harvester must spill quite a bit to feed such large flocks of geese. 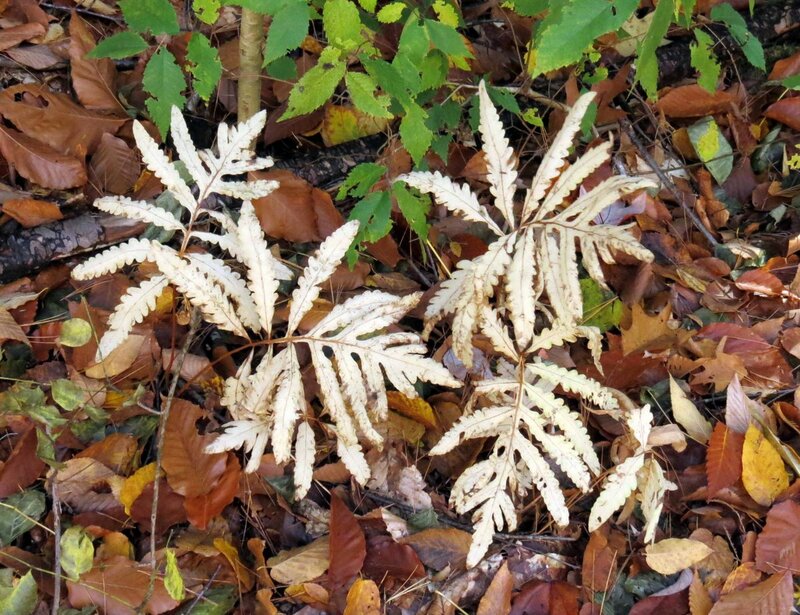 Early settlers noticed this fern’s sensitivity to frost and named it sensitive fern (Onoclea sensibilis.) This fern loves low, damp places so when you see it it’s a fair bet that the soil stays on the wet side. I don’t know if they eat it or use it for bedding, but beavers harvest this fern and I’ve seen them swimming with large bundles of it in their mouth. A Forsythia couldn’t seem to make up its mind what color it wanted to be. Another odd thing about this drought is how trees like oak are loaded with acorns and shrubs like witch hazel (Hamamelis virginiana) have more flowers than I’ve ever seen. They’re very beautiful this year, and fragrant too. 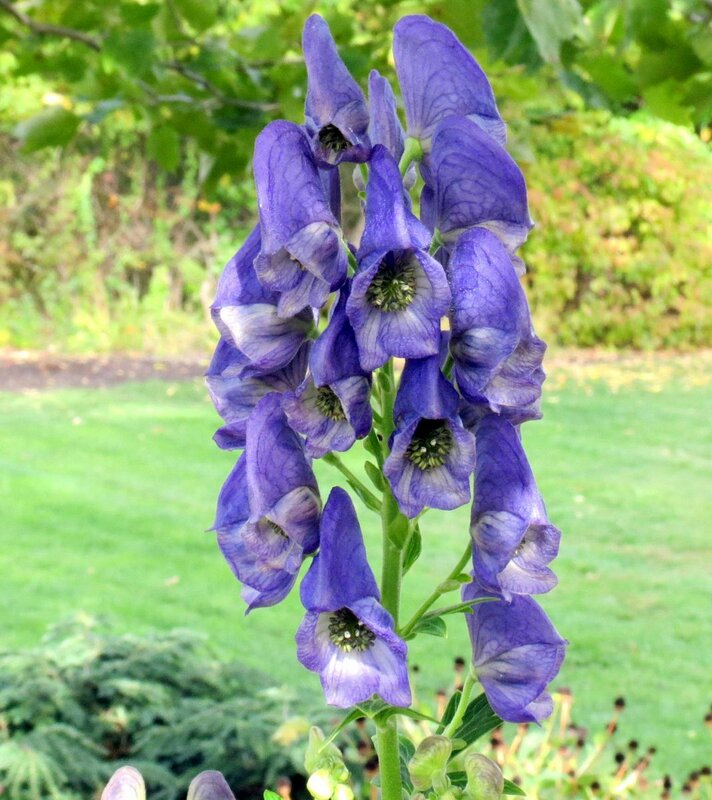 Witch hazels might be late bloomers but so is aconite, commonly called monkshood (Aconitum napellus.) It’s a beautiful flower which, if you look at it from the side, looks just like a monk’s hood. This plant can take a lot of cold and its blooms appear quite late in the season. Though beautiful the plant is extremely toxic; enough to have been used on spear and arrow tips in ancient times. In ancient Rome anyone found growing the plant could be put to death because aconite was often used to eliminate one’s enemies. It is also called wolfbane, because it once used to kill wolves.